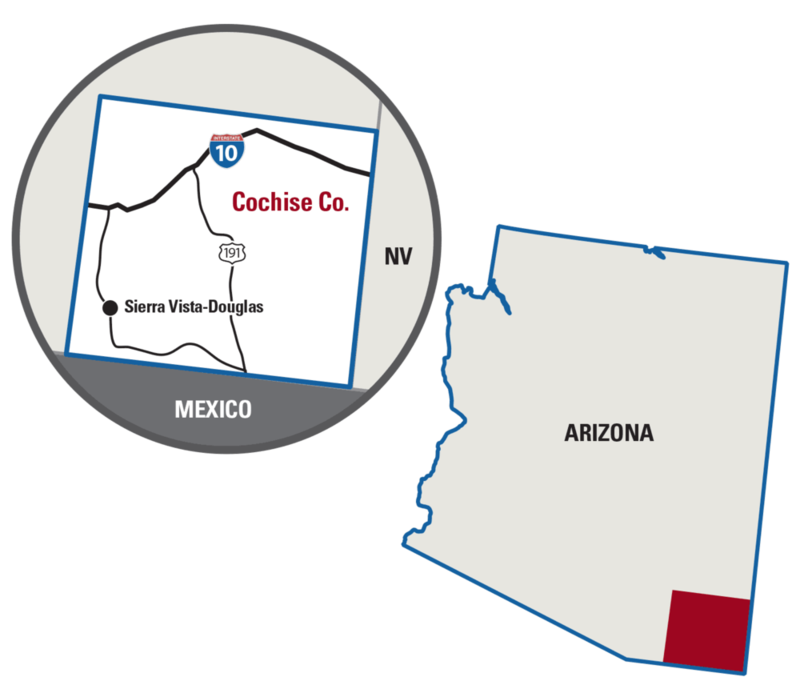 Cochise County, Ariz., is a large county (some 6,900 square miles) situated in the southeastern part of the state. It includes 83 continuous miles of the Mexican border. I recently returned from there, following my participation in Cochise County Sheriff Mark Dannel’s “Borders To Backyards” program, funded by the National Sheriff’s Association’s Educational Foundation. As drug addiction and use have reached epidemic proportions in the U.S., this program was designed to allow interested sheriffs, from across the nation, to visit and see firsthand the efforts being made to patrol and secure our southern border. I was fortunate to have been selected to participate in this vital initiative. For a week, I was embedded with Cochise County (Sierra Vista-Douglas, Ariz.) deputies assigned the grueling task of patrolling this expanse of border and travelled corridors extending several miles north into the county. Literally working shoulder to shoulder with them, I can attest to the fact that the effort, the resources and the dedication to this task are immense. While there, I patrolled with these deputies on foot, horseback, helicopter and using ground transportation including trucks and four-wheelers. I observed physical border security measures ranging from “The Wall,” (in the traditional sense), to what amounted to little more than a 1930’s era woven barbed-wire fence, to nothing separating our nation’s border. Our efforts resulted in the apprehension of a small party of people, which had crossed the border illegally, smuggling in excess of 300 pounds of marijuana into the remote Arizona high desert. The expansiveness of the territory and the sheer isolation were remarkable, but what impressed me most was the herculean effort these deputies put in day and night to stem the illegal activity along the border. While many assume there exists a level of animosity toward the immigrants by local law enforcement, what I witnessed contradicts that belief. The deputies realize that many of those trying to enter illegally are fleeing violence, are victims of human trafficking, or have been forced into work by the vicious Mexican drug cartels. What I experienced was a high level of empathy demonstrated for the immigrants and their families. While illegal immigration falls under the purview of the federal authorities, these deputies must deal with the criminal issues related to human trafficking and drug smuggling. They are our first line of defense in the battle against drug addiction and the crimes attributable to it. Why may you ask, was it important for me to travel 1,600 miles away to study the problem firsthand? Between 2007 and 2017 our Commonwealth has identified 869 victims of human trafficking and prosecuted 373 cases related to them. Many of the victims are females and are of Hispanic origin. Too, the DEA reports that 90 percent of the illegal opiates in the U.S. originate in Mexico or come through Mexico from Central America. While we, for the most part, were successful in eliminating the traditional methamphetamine labs in our region in the first decade of the millennium, locally-manufactured meth was quickly replaced by crystal meth and heroin originating south of the border. These drugs are not confined to our border states, but, rather, flow through them and into the heartland of the U.S. In fact, within the last three months, in excess of 70 pounds of crystal meth have been confiscated by law enforcement in our region alone. And along with the drugs come the armed traffickers and the violence they espouse. We must also deal with the crimes committed to feed the addiction such as robbery, burglary, and theft. Last, but certainly not least, are the domestic violence crimes and the broken families we are left to deal with in the wake of this epidemic. Simply put, an unsecured border directly impacts criminal activity committed locally. I traveled to Cochise County to further my understanding of the origin of the crimes being committed in our Commonwealth. My first and most pressing priority as Daviess County Sheriff is to protect and serve the citizens of my community. Furthermore, as a member of the National Sheriff’s Association’s Board of Directors, it is incumbent upon me to be as knowledgeable as possible on significant issues facing sheriffs across the nation. I came away from my experience with a greater understanding of the problem we face along our southern border. And, I learned of strategies and technologies we can utilize here on surveillance-based investigations. Landowners along the Mexican border with whom I spoke have a unique insight into the issue of border security. My colleague, Howard Buffett, Macon County, Ill., Sheriff, who is a landowner in Cochise County, noted in his book, “Our 50-State Border Crisis,” “……the Mexican cartels have grown astonishingly powerful by exploiting both the gaps in our border security strategy and the desperation of migrants. The cartels are profiting enormously off America’s growing addiction to drugs.” Unfortunately, the opioid crisis suffocating our country, and the issue of insecure borders are often viewed as separate issues. I believe they are intimately connected. Ineffective border security policies not only endanger border states such as Texas and Arizona, they also put ALL Americans at risk. We are a nation in crisis. The number of opioid-related overdose deaths has quadrupled over the past few years. I believe we can, and will, overcome this crisis, but it begins with educating ourselves and ends with a united effort across the local, state and federal levels in addressing this issue.